In 1945, Gabriela Mistral became the first Latin American woman to win the Nobel Prize for Literature. The poet and essayist became a mythic figure in Chile and Latin America, enshrined in the popular imagination as a modest, rural schoolteacher who wrote children’s verses and love poetry and suffered from the unfulfilled desire to be a mother. Strong and passionate, exceptionally intelligent and sensitive, and nearly 5’11” tall with rather masculine mestizo features, Gabriela was extremely well-educated and ahead of her time. She was much more than the partially selfcreated myth that came to define her. Not only did she become a great writer whose work still resonates with readers today, but she was also an activist who fought for education, pan-Americanism, the rights of women and the oppressed, and recognition for mestizo peoples in Latin America. The recent discovery and publication of previously unknown documents has shattered the old image of Mistral that reinforced the idea of a submissive woman whose main goal was to bear and rear children. Mistral was born Lucila Godoy in 1889 in Vicuña, a small city surrounded by mountains in the Valle de Elqui. Her school teacher father abandoned the family when she was only three. She dedicated many poems to her seamstress mother. Widowed by one man and abandoned by another, her mother had a daughter with each man: first Emelina and fifteen years later, Lucila. Gabriela’s first teacher was her sister Emelina. The future writer’s early education was rather informal since the family’s precarious finances forced them to move constantly. Thanks to her eagerness to learn, a benefactor gave her access to his library where she essentially taught herself. At the age of fourteen, she began to publish articles and poems in small newspapers in Villa La Serena and Vicuña. The La Serena Teachers College refused to admit her because they considered some of her articles “revolutionary,” so beginning at age 16, Gabriela took jobs teaching in schools in small towns in northern Chile. At the age of 21, she scored very highly on an aptitude test at a Santiago Teacher’s College, which allowed her to teach in secondary schools in cities and towns throughout Chile. While working in northern Chile, Gabriela fell in love with a young railroad worker who committed suicide in 1909 to escape his debts; by that time, any relationship that might have existed between the two had already ended. Nonetheless, the railroad worker, Romelio Ureta, gained a place in literary history as the inspiration for Los Sonetos de la Muerte (Sonnets of Death) and other somber works by the poet. Gabriela’s letters mention other men before Ureta. At any rate, Mistral scholars insist that the poet in her was nourished by the mournful feelings triggered by Romelio’s suicide, propelling her to write many of her desolate verses, tinged with mysticism. Los Sonetos de la Muerte won the highest honors in the 1914 Juegos Florales, after which Gabriela Mistral’s fame began to slowly increase at home and abroad. Meanwhile she continued her nomadic life, teaching in different schools in Chile, while publishing poems and essays in newspapers and magazines. Starting in 1918, she began serving as head of several schools in several different cities. In Temuco, she encouraged the writing of a talented teenage Pablo Neruda, Chile’s other Nobel Prize winner. Both came from humble backgrounds and both were precocious writers, activists, and diplomats. One was from the coast and the other from the mountains, one from the south and the other from the north, but both were purely Chilean despite all of their wanderings. 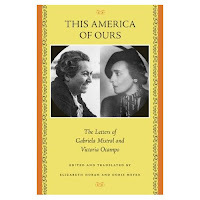 During those years, Gabriela carried on a steady romantic correspondence with Chilean poet Manuel Magallanes Moure. In her refusal to give Magallanes Moure the “proof” of love he requested, she wrote to him: “I think you will eventually succeed in destroying the shameful images I have of sensual love as something savage and brutal.” Volodia Teitelboin, in a study published in 1991, writes: “The frustrated lover (…) corners her with questions. She finally confesses that she is traumatized by a childhood event. When she was seven, a young lad who used to visit raped her. Teitelboin’s study was published before the National Library of Chile received Mistral’s undiscovered documents, which suggest other possible explanations for her refusal of Moure’s advances. In 1922, after the triumph of the revolution, Obregón governed México. The Mexican Secretary of Public Education went to Chile, met Gabriela, and invited her to collaborate on a project that would create public libraries in México. This invitation prompted the writer to leave Chile for the first time at the age of 33. She traveled with Chilean sculptor and painter Laura Rodig; they were welcomed to México by Palma Guillén, with whom they remained lifelong friends. Gabriela found herself in postrevolutionary México, indigenist and inspiring –the México of Diego Rivera, Siqueiros, Orozco and many others. Her experience in the land of the Aztecs changed her forever; she loved the country that had welcomed her with open arms. Nevertheless, some resented the attention paid to “the foreigner” and she sadly left after two years. Meanwhile in New York, the President of the Instituto de las Españas read some of Mistral’s poems to his colleagues. “Where can we get her books?” they asked in admiration. Gabriela had no published books. Ironically, her first book, Desolación (Desolation), was published in New York. After México, Mistral went to the United States where she gave classes and held seminars at universities. She returned to Chile in 1925 after the publication of Ternura (Tenderness), her second collection of poems. She did not stay long; she left for Europe the following year. Next, she traveled through Central America and in 1932, she was appointed to the lifetime post of consul in several European cities and Petrópolis (Brazil). By now, Gabriela was well-established as a “rootless” traveler who returned to her homeland only for brief visits. “What is Gabriela running away from?” asks Volodia Teitelboin in her study. In 1938 her third book of poetry, Tala (Destruction), was published by Argentinean Publisher Victoria Ocampo, with whom she corresponded constantly. That same year, she spent some time in Chile after thirteen years of absence. Gabriela adopted a child named Yin-Yin. She told one friend that he was a nephew and another that he was a friend’s son. Some people believe that Yin- Yin was Gabriela’s biological child, but the most likely explanation is that he was indeed her nephew. Together, Palma Guillén and Mistral raised this child who was so deeply loved by Mistral. Tragedy struck in Petrópolis in 1943 when Yin-Yin died from arsenic poisoning at the age of 18. Once again, a suicide touched Gabriela’s life, this time taking the person she loved most. The poet sunk into depression to the point of madness. Guillén rushed to be with her friend and did not leave until she was sure that Gabriela’s life and mental health were no longer in danger. Soon afterward came “that Stockholm thing,” which is how the writer referred to the Nobel Prize she won in 1945. The Nobel was followed by many honors and honoris causa doctorates, and her invitations to conferences multiplied, as did reissues and translations of her works. Eventually, Gabriela was named consul to Los Angeles and she settled in Santa Barbara, California. In 1952, she went back to Chile for the third and final time since leaving her country at age 33, returning to receive the National Literature Prize and launch her fourth collection of poems. Her last work, Poema de Chile (Poem of Chile), was written in Santa Barbara and published posthumously. Twenty-seven-year-old Doris Dana was a beautiful New York writer from an aristocratic family. An admirer of Gabriela, in 1948 she sent Mistral a translation of one of the poet’s essays accompanied by a letter expressing her devotion. Gabriela invited her to California, sparking a love that lasted for nine years. The lesbian relationship between Gabriela and Doris –who was 31 years younger and officially known as her “personal assistant”– was confirmed only after Doris’s death in 2006. Since Mistral’s death Doris served as her heir and literary executor. Doris Atkinson, Dana’s niece, donated a treasure trove of 168 boxes of Mistral‘s unpublished poems, manuscripts, photos, and other documents to the National Library of Chile.